Arky and Iris are dealing with the disappearance of their scientist mother in different ways-- Arky is running, and hanging out with his football playing friends, and Iris spends more and more time playing the antique English horn that her mother left behind with a cryptic note. When Arky's friend Matt is accidentally sent back in time by the power of the musical instrument, the twins have a renewed hope that their mother might return. Matt, of course, is completely shocked to find himself at the Carlisle Indian School in 1907! He meets an ancestor of the twins who explains a little about the time travel to him, and it seems like Matt might be stuck in time until until he mends some of his ways. 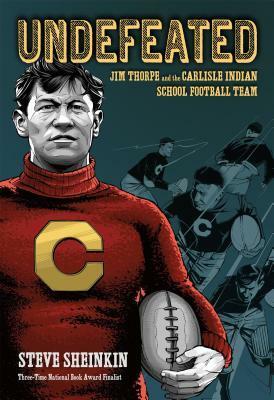 In the meantime, he meets Jim Thorpe and joins the Carlisle football team. Football in 1907 was very different from what it is today-- and so are the girls, like Tawny Owl, who is not only training to be a nurse but who has an unusual interest in football. While Arky and Iris are trying to figure out how the time travel works, can Matt manage to break away from 1907 in time to return to the present to win the championship football game for his own team? Strengths: I am excited to give this to my students who only want to read books about football, because it might get them interested in time travel stories or history. There are enough details about football, both past and present, that I didn't understand a lot of it. That is always my rule of thumb for a good sports book! The Carlisle school and institutions like it have appeared in children's literature before, but I've never heard about the football team, so this is a great topic. 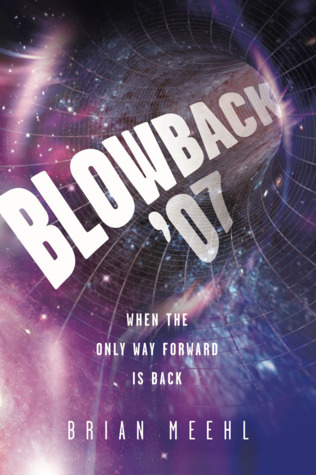 This is slightly more appropriate for high school (there is a party with some drinking, and a bit coarser language at parts), but nothing that would keep it from being a good choice for middle school students. I am looking forward to the two sequels. Weaknesses: While the word choices and general description of life at Carlisle might draw some fire from Native American concerns, I think that they are in line with the attitudes and mores of the time and place. Imposing modern sensibilities on historical characters is disingenuous, although I suppose Matt could have complained more about the treatment of Native Americans, although that really wasn't his main concern, nor was it in his character. What I really think: It's too bad that this is self published, because it will be harder for schools and libraries to get a copy. It's my decided opinion that all historical novels should include football, and this is a fantastic choice for high school and upper middle grade readers who are interested in the sport. If you're leery about self published books, rest assured that Meehl's writing is quite facile and fun to read. "America's favorite sport and Native American history collide in this thrilling true story about one of the nation's greatest football teams. But this is not just an underdog story. It's an unflinching look at the persecution of Native Americans and its intersection with the beginning of one of the most beloved—and exploitative—pastimes in America, expertly told by nonfiction powerhouse Steve Sheinkin." In a slightly futuristic world, Mori and her friends live in a highly protected neighborhood where everything is great. Old Harmonie was developed by Mori's grandmother and others in response to deadly diseases, and structured so that as many dangers were diluted as possible. This makes the world a little boring, so when a new girl moves in to a house on Firefly Lane, Mori and her friends are excited. Alana is a bit odd (she's from California), but she and Mori start to investigate the run down, older house of Mori's grandmother's scientific partner and find out a lot of secrets about the community and about Alana herself. Strengths: This is a solid, middle grade Dystopian tale enlivened by Mori's bucking of authority. 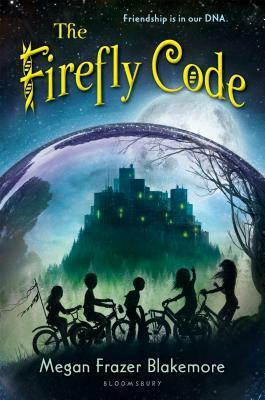 Lots of good details-- children can be natural or "designed", there are threats from the outside world, and Firefly Lane seems like any close knit neighborhood in toady's world. Since it is a bit in the future, there's a nice cultural diversity; I think there was a mention that most people have a somewhat dark skin. Weaknesses: It seemed a bit odd that the children in the future are allowed to roam around unsupervised. All of their parents are working-- I just would expect year round school or enrichment programs, since the parents are very motivated. What I really think: Dystopia is on the wane in my library, and this is supposed to be a series. May pass.